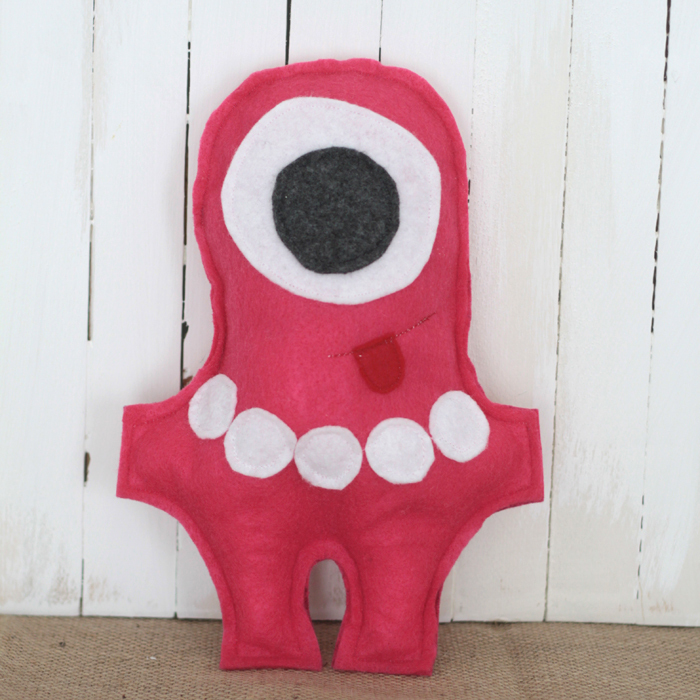 In today’s post: These cute felt monsters are a great way to teach your kids to sew – they’re the perfect beginner sewing project! I first shared the pattern for these little felt monsters six years ago. It’s one of the few posts from early on in my blogging career that I actually still like, so I thought I’d pull it out of the archives to share with those of you who weren’t around back then. Enjoy! Scary eyes, scary mouth, and a big heart. 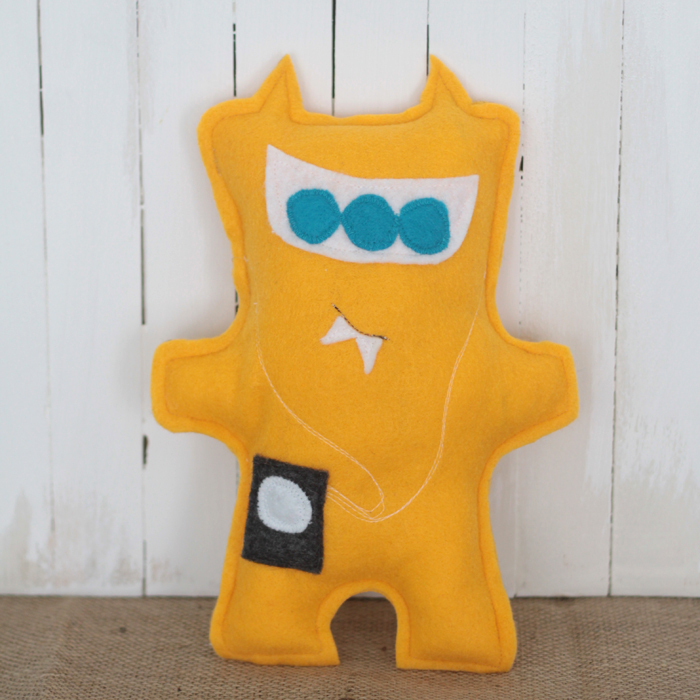 Younger kids can help trace their monsters, pick out eyes/mouth/accessories, and hang out with you while you sew it up (and maybe even sit under the table and push the sewing machine pedal for you). Then they can help stuff their creation. 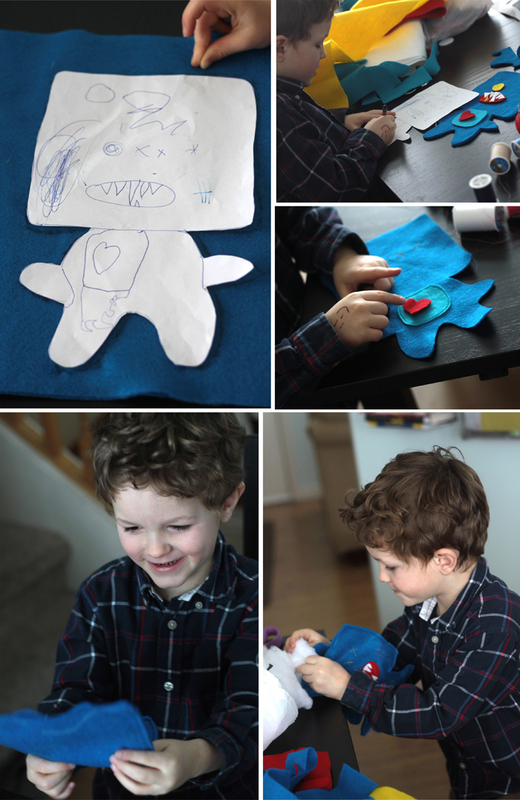 Older kids could do all the cutting and tracing on their own, as well as sew the monster together (with a little help). It’s a great interactive project. The 8 page PDF pattern can be downloaded by clicking here. Just print it out and then cut out the pattern pieces you’d like to use. 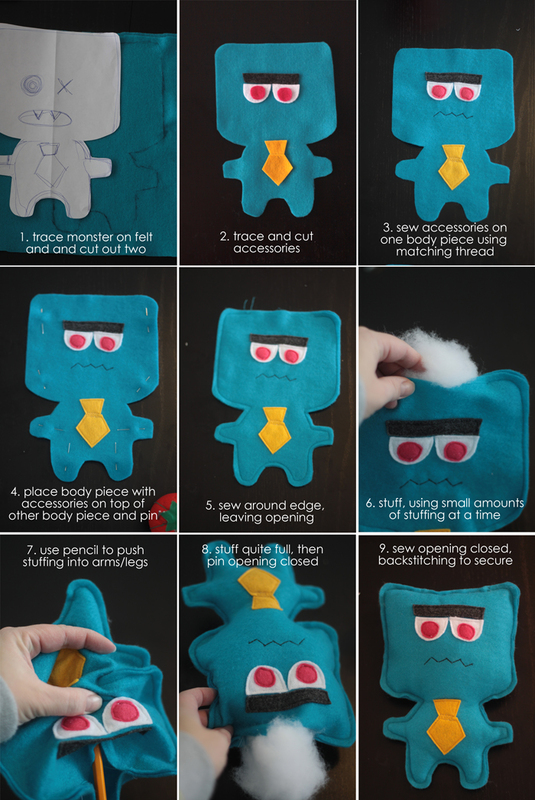 Trace the pieces on felt, and you’re ready to put your monster together. Construction is so easy you probably don’t need instructions, but here are some step-by-step photos, and I’ve added a few tips below. Things to note: I used different colors of acrylic felt cut from a bolt at Joann’s. I purchased 1/4 yard of each color, which came to $1.25 each at regular price, and I could have easily made three monsters from each 1/4 yard piece. Acrylic felt is cheap and comes in lots of colors, so it works well for this project, but it will pill as the monsters are played with and snuggled. Wool felt (or a wool blend felt) is more expensive but will hold up much better. 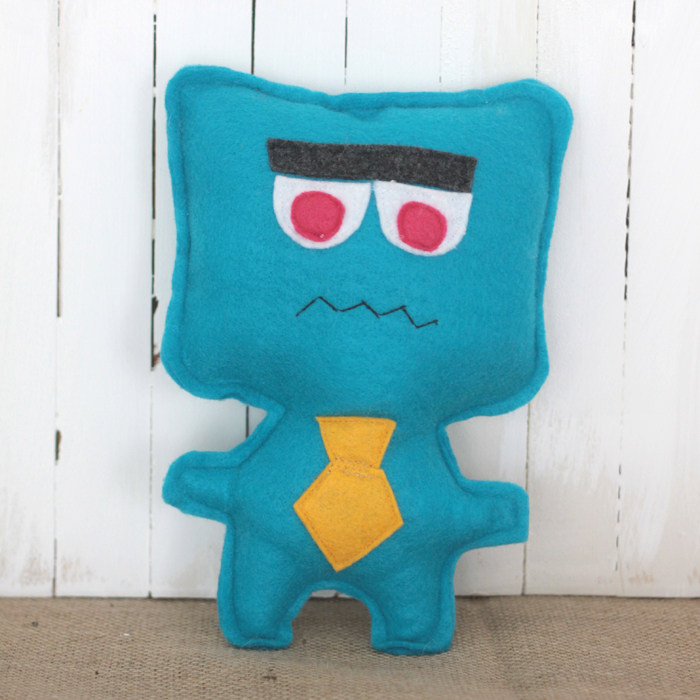 This turquoise guy above is the easiest monster, so if you’re new at sewing this might be where you’d want to start. I sewed my monsters together so the seam allowance is visible on the outside – I think it gives a little sharper look and more definition to the small pieces (like horns and spiky hair). But if you don’t like that look, just sew the front and back of the monster with right sides together, then turn it right side out before stuffing. When sewing on eyes/mouth, etc., you can use either a straight stitch or a zig zag stitch. On the pink monster above I used a straight stitch, but on the yellow monster below I used a zig zig. I found that the zig zag was a little easier on circular objects, but a bit harder on objects with points (like the teeth). I think it looks fine either way. I sewed everything on in matching thread, meaning I switched thread four or five times for each monster. However, I used a white bobbin on everything but the grey/black pieces and it worked just fine. In fact, when I sewed the front and back pieces together I also used a white bobbin thread, and the back looks just fine – so I think you could probably get away with sewing all the pieces (except grey/black ones) with white thread – just use a straight stitch, not a zig zag, if you try this. My apologies that this red guy looks so much like a little devil. I really didn’t intend it – but when I cut him out in red and added the fangs and guitar he just got a little, well, devilish. My nine-year-old thought it was pretty darn cool, though…so maybe this monster will appear to older kids. When you’re sewing these up and you get to a point or a corner, leave your needle down through the fabric then lift your presser foot and turn the material to make a nice crisp corner. You’ll probably need to do this a few times around some of the tighter curves as well. I sewed them all up with about a 1/4 inch or 3/8 inch seam allowance. Lastly, when stuffing you want to remember to stuff in a little at a time, and start by stuffing the small areas like arms and legs and use a pencil to poke the stuffing in nice and tight. You want to stuff these really firm, so use a lot of stuffing. When it’s all stuffed up, squish the stuffing that’s near your opening in very tight so you can pin the opening closed far enough away from the cut edge of the felt that it will fit under your presser foot. Be sure to backstitch at the beginning and end when you sew the opening closed. When it’s all sewn up, check the edges for any areas where the seam allowance looks a little sloppy. Trim if needed to make it even. 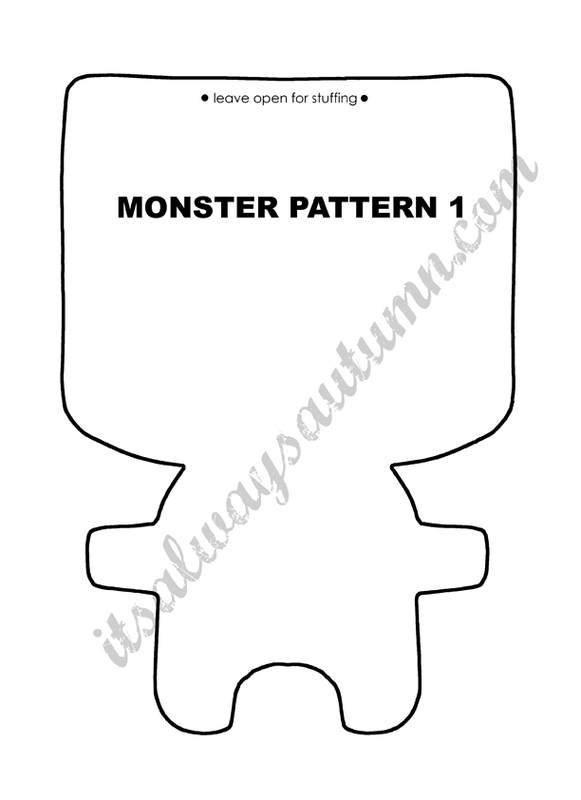 I had a great time making all these monsters and my boys had fun helping – so I hope you enjoy the pattern. Please let me know if you try it out! My 9yr old is so excited about these! He can’t wait to make one for his little brother. Thank you!! I normally alawys just ask for three yards unless I know specifically what I am going to make from the piece of fabric. I think after sewing for so long you can pretty much guess what you need. I think the 3 yards=60 inches and 4=45 is great advice. These are so much fun! 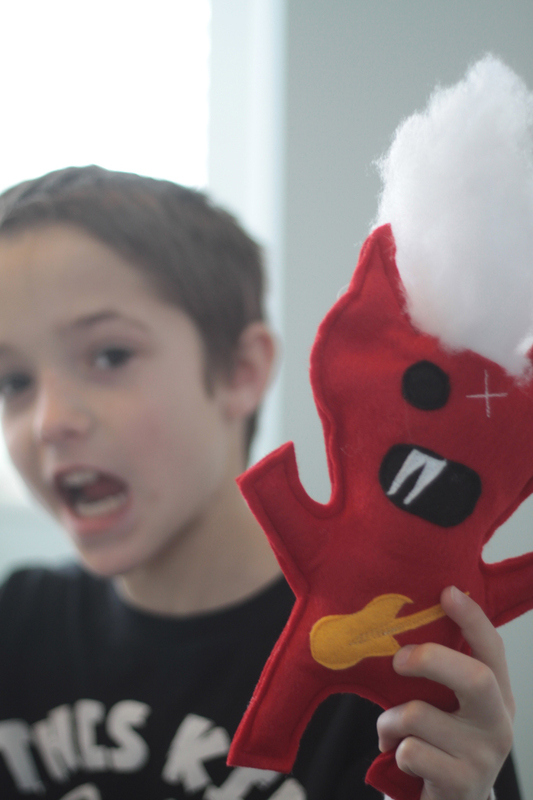 I love how you took your son’s design and made it into a real doll. He must have been thrilled! How cute! 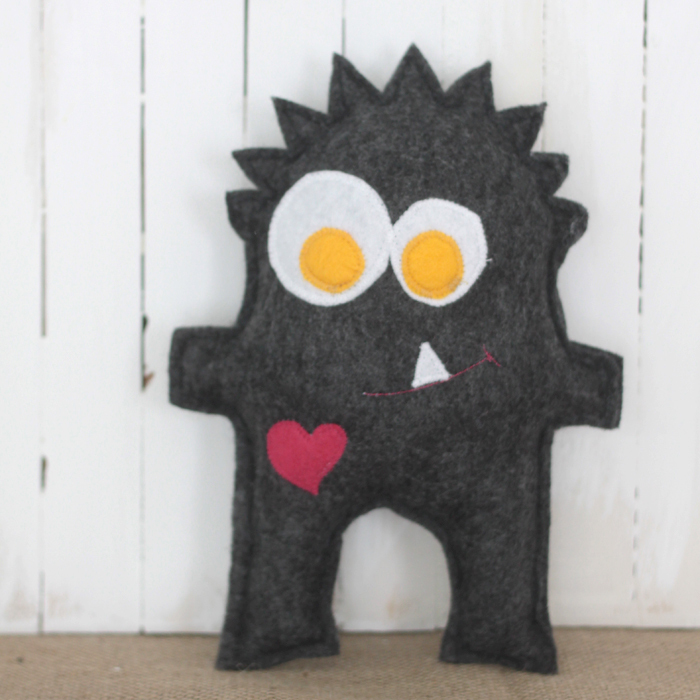 My oldest loves Ugly Dolls, I know she’ll have a blast making these! Thanks for the pattern! How incredibly fun! I love how you made the pattern from your son’s drawing. I am definitely pinning this to refer to later. Thanks so much for sharing!! Super cute! I bet you are going to get featured on many blogs because these are so adorable!! Oh the ridiculous cuteness! I want to make some for my nephew asap – he’d be so in love! Soooo cute where did you get that wonderful idea? I could make several devils at my house. Love this…sharing at my fabric board over at Pinterest. These are too cool! Huge monster fan here (I make them for a living!) so I totally love this! love these! such a great idea to get your kids involved too. congrats on your someday crafts feature too! These are so cute! Thanks so much for linking up over at The Winthrop Chronicles! Those are super cute! I love the mix and match aspect. I would also love to link to your pattern if you didn’t mind. Ohhh thank you for the template, i love monsters! Thank you SO much for the free printables! This is exactly what I was looking for for my son’s birthday. They are so cute!! I want to make them but the PDF file doesn t download.. Isn t there any other way to print the templates? **Artemi – when you click the link it should open a new tab or window with the pattern in it. Then you can right click to download. I’ve gone ahead and emailed the pdf file to you as well. Thanks! I love love love these! We just made our first two, I let my son draw them one for him and one for his sister! They love them! I love these! How cool that you took your childs drawing and created this! 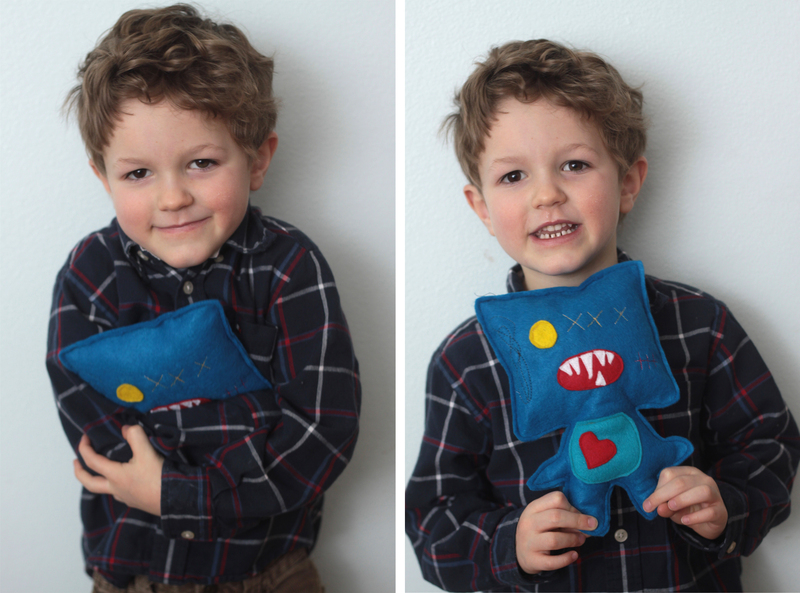 Thank you very much for this pattern, I sewed some monsters for my son’s 4th birthday and they were a huge success, the kids were very happy with them. Fantastic! It’s so much fun when the kids just love something you’ve made! You’re welcome. Hey thanks for the pattern! I’ve been looking for a new one for my daughter to re-try her hand at sewing and I’m hoping the monsters with mix and match design ( for my mini-control freak :)) will be just the right motivation. I dig your pics too, good job! my grandkids love these monsters . . . thanks so much for the pattern!!! I loved these so much I went out, bought everything immediately and made them right away! They are a perfect little xmas gift for our neice. I posted a picture to my instagram if you want to check it out: instagram.com/karimgeiger they are not as professional looking as yours, but they are still darn cute! Thank you for the awesome pattern! So I came upon this looking for stocking stuffers thinking these would be cute and that I have all the necessary items on hand to make why not?! To make this project even better, I stumbled across Monster books in JoAnn’s that were 50 cents each so now they will all get the monster that matches there book. Thanks for the idea! I’m excited! Hi! I’ve just stumbled upon this blog and even though this is the first post I’ve seen…I love you already! 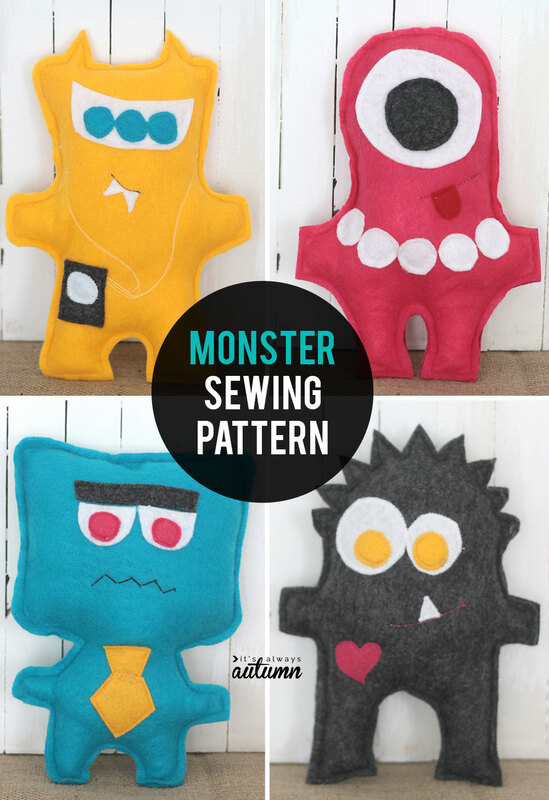 😉 I am an intermediate sewer, as I’ve only been sewing about four years now (I take a sewing class) and these monsters are adorable and this project seems very easy. I’ve been looking for something like this for my little brother and I’m glad I found you. Keep up the amazing blog! Thanks, Katie! Your brother is a lucky guy if he has someone like you to sew fun stuff for him. Good luck with it! Thank you so much these are so cute!!! I love them!! I just made a set for my nephews first birthday. He will love them! Felt is so fun to work with!! I have had a friend ask if I am going to make more to sell – is that possible with your pattern? 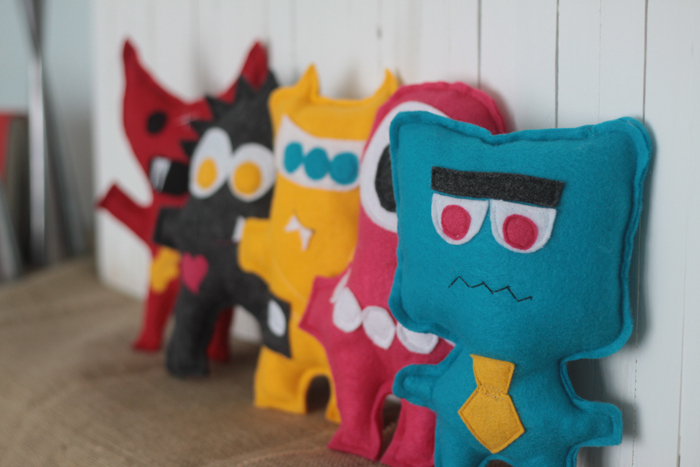 these moster plushies are oozing with cuteness! super love them! 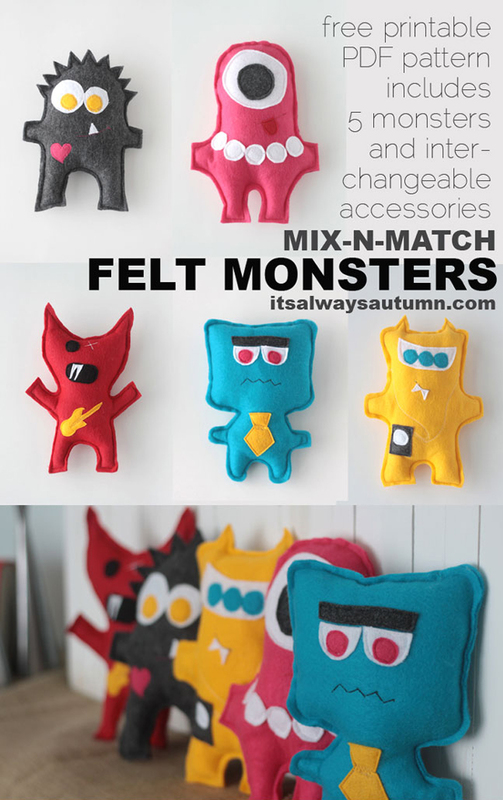 I featured this blog post in my blog:http://www.plushiepatterns.com/monster-felt-mix-and-match/ thanks for sharing! I love these monsters…cute, cute, cute! Thanks for the free pattern! These are great! I just started teaching a sewing club at my school for 3rd through 5th grade class and I had some boys interested! I am thrilled, but now need to find boy friendly projects – things besides the common headbands, purse/bag projects. I started with bookmarks and this will be a great first sewing machine project. Thanks for sharing! I am THRILLED to be teaching a Sewing & Textiles class here in our very rural high school and have turned to my fellow sewists and amazing bloggers for ideas and tutorial helps. My students,all 22 of them, (…that is a really good sized class around these parts, considering one of my Spanish classes has 8 students…) have created book covers, pin cushions, stitch samplers and are now ready to create their own monsters, being inspired by your family’s creations! Thank you for your continued ideas. I hope it is okay that I have shared your post with my students and have given you 100% credit on the project page where I give them instructions that I want them to follow and then my scoring rubric, etc. Please let me know if I have overstepped the sharing boundaries. I sure appreciate your re-purposing, re-cycling, up-scaling projects…as we are going to be doing a lot of that as well. (I looked at your blog policy, yet, I am not linking, just printing out an instruction sheet with “as inspired by http://www.itsalwaysautumn.com” listed on it.) The students are to make their own, but may choose to use your base shapes as starting points. Please help me know how to best honor your work and help my beginning students (they haven’t had sewing here in this district for over 10 years+) explore the wonderful world of creating through sewing. I so want to do right by you. I have two boys 6 and 7 years old. They had so much fun designing their monsters. At our craft store they sell felt by the sheet 4 for $1 so I think I spent maybe $2. I don’t have a sewing machine though and am not very experienced with sewing so it took me three days to get theirs done. But it was really a lot of fun and the boys love that they created them. Thank you for the great idea. Sorry, I couldn’t figure out how to add a picture of them. We are making two hundred of these little guys to take to Girls Camp with us this summer. The girls will stuff them and add accessories, and then they will be donated to a children’s hospital nearby. Thank you for the free pattern! We are really excited to use this. These are so cute. I printed the pattern at 50% because i’m teaching my kids to hand sew and want them to start with smaller items. Can’t wait to get started! I used the patterns for my daughter. We loved them!!!! Thank you for sharing the pattern! I made these monsters in small my Twins-Birthday Party. That was so fun seewing them! I left them open so the kids can put their hands/fingers inside as puppys. The kids loved them! 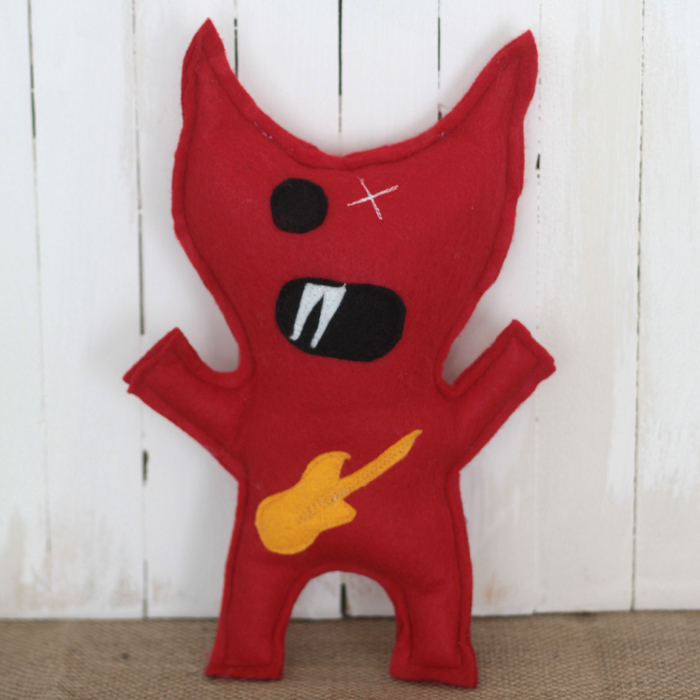 Hi Autumn, I do love this idea and am now in the process of making these Little Monsters for my 4 year old grandson. Many thanks for the idea and all the printable patterns. As I think felt sticks fairly well to itself, I’m thinking of sewing some of the features on, as well as the mouth lines perhaps, but making others and leaving them for him to stick on as he pleases. Do you think that will work? Thanks so much for this tutorial! I actually made 30 of these as take-aways for my sons monster-themed birthday party a month ago. They were fun to make and the patterns were super easy to follow. Many thanks! I would love to make these projects. However, the link doesn’t work for me….please help. These are creative little monsters. My kids are going to love these. We are going to try to make these over the next week as I showed it to them and wanted to know when we could make them. Thanks for sharing!